Three Australian design teams are in the running for the world’s largest sustainable design prize – the Danish INDEX: Award worth €500,000. The three Australian designs in the running include a textile that can be cleaned with sunlight by RMIT University; a matchstick-sized implant, the Stentrode, to help paralysed people regain mobility by The University of Melbourne; and Sundrop Farms – a revolutionary sustainable farming system in Port Augusta, South Australia. 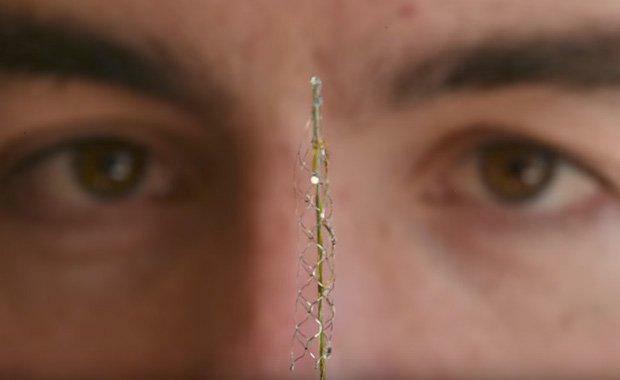 The Stentrode is a matchstick-sized implant delivered into the brain through a small catheter. It works by using the patient’s thoughts to control a robotic exoskeleton, which in turn, moves the patient’s body. By expanding, the implant presses electrodes against the patient’s blood vessel wall close to the brain, where it can record neural information and translate these signals into commands that can be used to control the exoskeleton. There is no craniotomy, no risk of infection; it is all run through the groin and passed inside the body up into the brain. concentrated solar power plant consisting of 23,000 mirrors directing the sun at a 127-metre-high tower weighing 234 tonnes. By taking a sustainable approach to greenhouse growing, Sundrop uses advanced technology to increase produce quality and consistency, and dramatically reduce environmental impact. The system allows Sundrop to produce over 15,000 tons of sustainable tomatoes annually (sold at Coles supermarkets across Australia), while saving 2 million litres of diesel and 15,000 tons of CO₂ when compared to traditional farms. Textile Cleaned With Sunlight is a fabric designed with a focus on shifting from water to sunlight. The designers used nano-threads to create a fabric that can be cleaned with nothing more than sunlight. Silver and copper nanostructures woven throughout the textiles absorb sunlight. This then heats up the fabric on small scales and breaks down organic matter. In other words, when the fabric is exposed to light, it breaks down and eliminates e.g. a food stain. Since its establishment in 2005, the Danish INDEX: Award continues to flourish. The Award’s contemporary interpretation of design – solutions that seek to solve real societal challenges – will be celebrated 1 September when the winners are revealed. This year, there are 56 finalists in the running for the top five prizes, from a total of 1,401 nominees from 85 countries. "Design is no longer just about aesthetics – it plays an essential role in solving the world’s greatest challenges. And I am proud to see that the world is slowly recognising this potential. This year’s finalists are already making a tremendous impact, and most of them will disrupt many industries and businesses we know today," says Kigge Hvid, CEO of INDEX: Design to Improve Life - the organisation behind INDEX: Award. The ceremony will take place in Helsingør, a city just north of Copenhagen.